At Hitting World, we carry the best selection of pitching machines for baseball and softball players of all ages and skill levels. Whether you’re looking for a simple soft-toss pitching machine or a fastball pitching machine that throws heaters at 100 mph, we’ve got you covered! These pitching machines will help take your game to the next level, with variable speeds and pitches to give you the most intense batting practice to ensure you’re ready to step up to the plate when your time comes. All of our pitching machines are portable, durable and built to last. All of our baseball and softball pitching machines are made from the highest-quality parts and guaranteed to deliver unparalleled performance for your family or team. We only carry the top brands, including Rawlings, ATEC, Jugs, Sports Attack and others, and we have the expert knowledge you need to make the right decision for your family or team before you buy. Shop now to take advantage of our competitive prices, with fast, free shipping on select orders. The B-1 Curveball machine gives you the economy of a single-wheel machine with the ability to throw different pitches. Adjustable machine throws fastballs, sliders and curves at various angles. Recommended for ages 12 and up. FREE SHIPPING! The economical BATA-1 Pitching Machine throws perfect fastballs up to 70 miles per hour with pinpoint accuracy. Ideal for batting practice for players up to age 16 & for machine pitch leagues. Choose between Baseball, Softball, or Baseball/Softball Combo models. FREE SHIPPING! The versatile BATA-2 Pitching Machine is the choice of many major league teams. Capable of throwing any type of pitch, with a maximum speed of about 100 miles per hour. Also ideal for throwing grounders and flyballs. Choose between a baseball and softball model or get a combination of the two. FREE SHIPPING! The JUGS Toss™ Machine is a high quality, highly portable soft toss machine that automatically tosses a ball every 5 seconds. Weighs just 13 lbs. and holds 14 baseballs or 10 softballs. Get up to 8 hours of continuous use and it comes with a 2-year guarantee! The BATA-1 Twin Pitch machine can throw two different pitches in one set up. A fastball and change up, or two fastballs to different locations. Ideal for softball. Throws up to 70 mph. Choose between Baseball, Softball, or Baseball/Softball Combo models. FREE SHIPPING! For serious hitters only! You wanted more speed...YOU GOT IT! The BATA 2Pitch3 Baseball Pitching Machine can throw a 95 mph fastball and a 75 mph curveball IN ONE SET UP. 3-wheel design with welded steel construction. Throws flyballs and ground balls too. FREE SHIPPING! The Spinball Wizard two wheel pitching machine features a versatile design that allows the same basic machine to be used for baseball and softball. Spinball Wizard can be set to spin the ball in any direction to simulate virtually any pitch. Available in baseball, softball, or combination model. FREE SHIPPING! The Rawlings Proline 3 Wheel Pitching Machine is designed with iPitch® electronic control panel for the ultimate in velocity, control, and ease of use. With three separate wheels pitch selection and speed couldn't be easier! Available in baseball, softball, or combo models! FREE SHIPPING! The Rawlings Pro Line 2 Wheel Pitching Machine is a full featured pitching machine that throws any pitch from any angle. The 2-wheel pitching machine also swivels freely for defensive drills anywhere on the field. FREE SHIPPING! The Spinball Wizard 3 Wheel Pitching Machine throws any pitch at any speed from 40-100mph. Available in baseball, softball, or combo models! FREE SHIPPING! Our best selling lite-ball machine! This portable wiffle-ball pitching machine throws golf-ball sized lightweight balls with great accuracy. Great for hand-eye coordination. FREE SHIPPING! Get in your soft toss cuts without a partner. Easily change the height and angle the ball is delivered to the hitting zone. Do various drills with side toss, front toss and back toss. Great for high school and select team hitting stations or backyard use. FREE SHIPPING! The Backyard Batter soft toss machine builds hand eye coordination, hitting technique, muscle memory and bat speed. Features adjustable height and arch of the pitch, and adjustable time interval. Works with softballs, baseballs and tennis balls. FREE SHIPPING! The Triple Play PRO Pitching Machine is a highly accurate 3-Wheel Machine that can automatically throw Fastballs, Sinkers, Curves, and Sliders with just the push of a button. The pitch speed is adjustable from 40 to 90 MPH in 5 MPH increments, and is digitally displayed. The Triple Play PRO Softball Pitching Machine is a highly accurate 3-Wheel Machine that can automatically throw Risers, Sinkers, Curves, Drop Curves, Screwballs and Drop Screwballs with just the push of a button. The pitch speed is adjustable from 35 to 70 MPH in 5 MPH increments, and is digitally displayed. The Polyball Tutor Pitching Machine pitches baseball-size plastic polyballs (wiffle balls) that you can hit with a regular bat. Throws up to 60 MPH and weighs less than 28 pounds. Throws straight fastballs, mildly breaking sliders, and sharply breaking curveballs. The Triple Play ULTRA Programmable Pitching Machine can simulate almost any pitcher you are likely to face. It can throw a 90 MPH fastball, followed by a 75 MPH curve, followed by a change-up, followed by a slider. And it can do it all automatically. Available in baseball and softball models. The Triple Play BASIC Pitching Machine throws FASTBALLS, SINKERS, CURVES and SLIDERS at speeds from 30 to 80 MPH. The Batting Tutor Backyard Baseball Pitching Machine was designed with the backyard batting cage owner in mind. Its simple one-wheel design can automatically pitch fastballs every 10 seconds at speeds ranging from 30 to 60 MPH to quickly develop the hitting skills of youth league players. Focus Small, Hit Big! The JUGS Small-Ball Pitching Machine improves accuracy, mental concentration, and depth perception. Pitches fastballs, overhand curveballs, fly balls, and ground balls at speeds reaching 75 mph! It is a perfect training aid for backyard practice, indoor practice, youth leagues, and high school & college teams. Learn to hit the breaking pitch without the fear of being hit! The JUGS Lite Flite Pitching Machine throws Lite-Flite Baseballs, 11" and 12" Lite Flite Softballs, and Bulldog Polyballs. Simulates left and right handed curveballs, sliders and fastballs at speeds reaching 85 mph! Lighweight and portable, it is perfect for backyard practice, youth leagues, and high school & college teams. Designed specifically for Pitching Machine Leagues! With the JUGS MVP Combo Pitching Machine, hitters see only accurately thrown strikes - no walks, no fear of being hit, and lots of action. The MVP throws 15-60 mph. The JUGS BP1 Pitching Machine is the most popular and widely used youth-league pitching machine in the world. 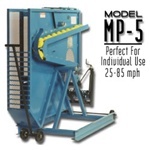 This versatile machine can be purchased as a baseball-only machine, or as a baseball/softball combo machine. Throws 15-70 mph. The JUGS Softball Pitching Machine is the most popular and widely used softball pitching machine in the world. Throws 15-60 MPH and works with 11" or 12" softballs, Lite-Flite softballs, Sting-Free softballs, Softie softballs, & JUGS Bulldogs. Also available with optional transport cart. The TriplePlay BASIC Softball pitching machine throws RISERS, SINKERS, CURVES, DROP CURVES, SCREWBALLS and DROP SCREWBALLS at speeds from 30 to 65 MPH. The Batting Tutor Backyard Softball Pitching Machine was designed with the backyard batting cage owner in mind. Its simple one-wheel design can automatically pitch fastballs every 10 seconds at speeds ranging from 30 to 60 MPH. The StrikeOne is a truly portable youth league pitching machine - not just because of its small size and built-in carrying handles, but because it can be operated from an optional battery pack so you can truly play anywhere. It throws fastballs at speeds from 20 MPH to 60 MPH. The StrikeOne is a truly portable softball pitching machine - not just because of its small size and built-in carrying handles, but because it can be operated from an optional battery pack so you can truly play anywhere. It throws risers at speeds from 20 MPH to 60 MPH to challenge every hitter. The all ATEC M1 Baseball Pitching Machine is the most complete and capable single-wheel training machine. Solid concave wheel design maximizes pitch speed and accuracy. FREE SHIPPING! The ATEC M2 (formerly the Casey Pro) is built to train collegiate level baseball players. When it comes to accuracy, power and portability, no other 2-wheel machine is better equipped than the M2. FREE SHIPPING! The Atec M3 Baseball Pitching Machine is built to train professional level ball players. Its industry leading 3-wheel design allows for hitters to have complete visibility of the ball throughout the entire pitch cycle, which improves their timing and increases their pitch recognition. FREE SHIPPING! The all ATEC M1 Softball Pitching Machine is the most complete and capable single-wheel training machine. Solid concave wheel design maximizes pitch speed and accuracy. FREE SHIPPING! The ATEC M2 (formerly the Casey Pro) is built to train collegiate level softball players. When it comes to accuracy, power and portability, no other 2-wheel machine is better equipped than the M2. FREE SHIPPING! The JUGS Changeup Super Softball Pitching Machine throws risers, fastballs up to 70 mph and changeups at speeds as low as 44 mph. The JUGS Changeup Pitching Machine throws fastballs up to 70mph and change ups at speeds as low as 50mph. It switches between fastball to curveball with the flick of a switch. The Triple Play ULTRA Programmable Softball Pitching Machine can simulate almost any pitcher you are likely to face. It can throw a 70 MPH rising fastball, followed by a 55 MPH curve, followed by a 50 MPH drop screwball. And it can do it all automatically.